2 - 2.....................Gero von der Mooreiche. 3 - 3.....................Asko von der Weyermühle. 3 - 3.....................Cora von der Mooreiche. 4,5,4 - 4,5............Bingo von Ellendonk. 4,4,5 - 4...............Cona von Niederkassel. 4 - 4.....................Ali von Langenhorst. 5 - 4.....................Akim von Vaciweba. 5 - 5.....................Guy's Hilo vom Norden Stamm. 5 - 5.....................Biene von Niederkessel. 5 - 5.....................Kim von Stadtwald. 5,5 - 5..................Jago von Beelen. 5,5 - 5..................Palma von Ellendonk. 5,5 - 5..................Satan von Ellendonk. 5,5 - 5..................Blanka von der Au. Faroh vom Blitzkrieger was born with outstanding confidence and extremely strong nerves which she displayed in every situation. At 4 months of age, Faroh passed temperament/protection instinct test under Martin Hellgiman (Germany). Faroh was extremely serious and focused in all bitework and tracking yet stable in her overall temperament. Faroh personified the German term "geltungstrieb" which refers to a dog that never wants to lose face in any situation. Faroh tested clear for vWD (VetGen), has full dentition and OFA Excellent hips (DP-9844E25F-PI). Faroh lived to 4½ years of age and passed away prematurely from kidney "filter" damage caused by unknown toxin or bacteria - it is believed she ingested anti-freeze coolant. 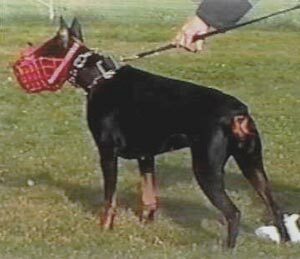 Her sire, Bronco von der Doberwache, was a Police trained dog who competed at the working FCI Championship in FH2 and working IDC World Championship in 1989 and 1999, he lived to 10½ years of age. Her dam, Allee vom Blitzkrieger, gained her Schtzhund 1 title (pronounced in bitework) in the United States and lived to 10¾ years of age. Icaro: BH and passed the Swedish Körung. He is sire of Briska's “Y” litter (Yennie, Yra) and vom Blitzkrieger “M” litter (Malinche). Kali: dam of the vom Blitzkrieger “N, O” litters (Nickolai, Orion).